A B Kirby & Sons are the Southeast’s leading specialists in tuckpointing. We use traditional craftsmanship, material and tools to achieve the perfect result. 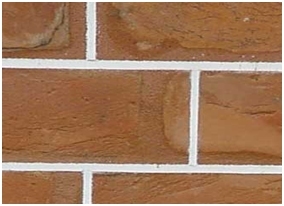 Tuckpointing is a way of using two contrasting colours of mortar in brickwork, one colour matching the bricks themselves, to give an artificial impression that the bricks have been laid with a very fine joint. 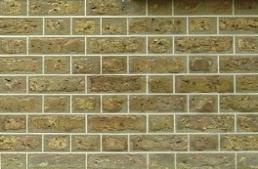 Tuckpointing was first used in the late eighteenth century to imitate gauged brickwork. 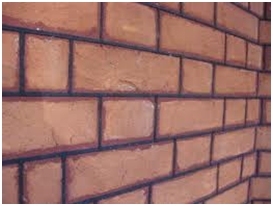 Constructed using rubbed or gauged bricks of fine red finish which were made slightly oversize and then individually rubbed or cut to a precise size. 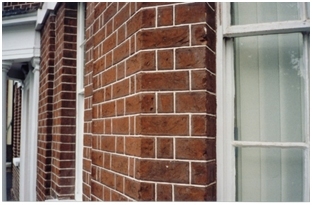 When laid with white lime mortar a neat finish of red brick contrasting with very fine white joints was obtained. Tuckpointing was a way of achieving a similar effect using cheap common bricks, usually reds or yellow stocks, these were laid in a mortar of a matching colour and a fine ribbon of lime putty (usually white but sometimes black) was applied to the joints before the mortar set. 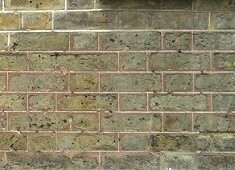 The name originates from an earlier, simpler technique, known as penny struck, used with very uneven bricks when a thin line, called a tuck was scribed into the flush-faced mortar but left unfilled, to give the impression of well-formed brickwork. When re-tuckpointing, A B Kirby & Sons use traditional tuckpointing tools, called "tuckpointing irons". These are used to apply the lime putty ribbon to the joint. The tools themselves are made from a hardened quality tool steel and are shaped with a sharp-pointed front with a flat base. They have a wooden handle which is attached with a brass ferrule. 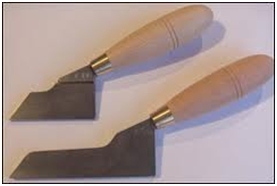 Tuckpointing tools are usually 4 mm and 6 mm thick and between 75 and 125 mm in length. 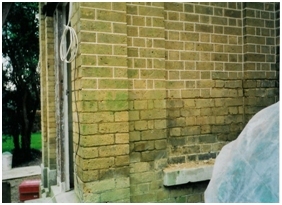 Re-tuck pointing is a highly-skilled method of repointing, whereby after the brickwork has been raked out and dampened down, a coloured lime mortar joint is applied to match the brick. 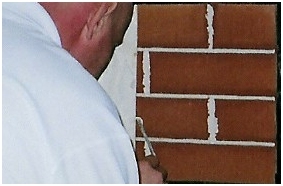 This is the rubbed flush to the face of the brick and grooved while still "green" or fresh, to receive a separate, and carefully placed lime putty ribbon. The ribbon is then neatly trimmed, using a knife and straight edge to form a precise, raised profile. It's intention was originally to create the illusion of accurately laid, cut and rubbed or gauged brickwork, on a standard brickwork facade constructed of, irregular bricks, however, it was often usd as a means to disguise inferior brickwork. Re-tuckpointing, because of the precise nature of the process, can take up to five times longer to complete than repointing with a flush joint. 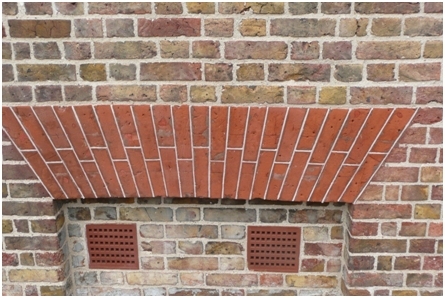 Because of this, tuckpointing is often only applied to architectural features such as arches or quoins, etc, to recreate the appearance of gauged brickwork. 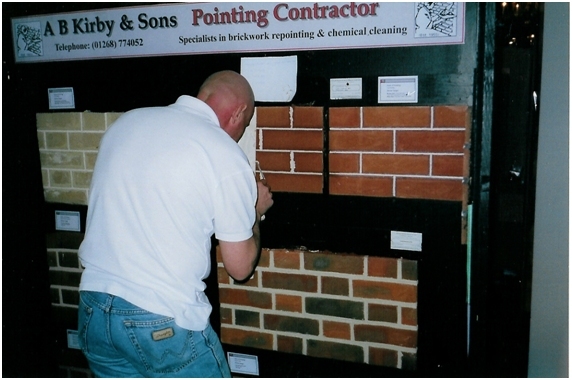 Below : A B Kirby & Sons demonstrating tuckpointing at the Hatfield House Listed buildings and conservation exhibition 2006.